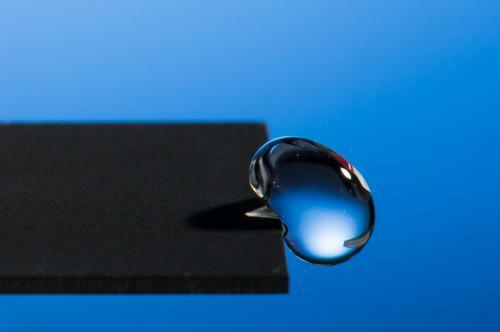 "The material is so strongly water-repellent, the water actually gets bounced off. Then it lands on the surface again, gets bounced off again, and then it will just roll off from the surface," said Guo, professor of optics at the University of Rochester. That whole process takes less than a second. The materials Guo has created are much more slippery than Teflon—a common hydrophobic material that often coats nonstick frying pans. Unlike Guo's laser-treated metals, the Teflon kitchen tools are not super-hydrophobic. The difference is that to make water to roll-off a Teflon coated material, you need to tilt the surface to nearly a 70-degree angle before the water begins to slide off. You can make water roll off Guo's metals by tilting them less than five degrees. Superb accuracy in water measurement, Jessica thought. And she noted that the walls of the meter trough held no trace of moisture after the water's passage. The water flowed off those walls without binding tension. She saw a profound clue to Fremen technology in the simple fact: they were perfectionists.